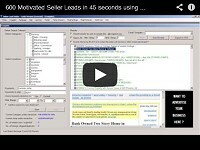 I just wanted to let you know that my good friend Duncan Wierman just sent me a copy of his latest edition Online Lead Finder Software (Version 2.1.0) for harvesting leads off the Internet in seconds. Because of our close friendship, Duncan is allowing me to give this incredible software away for FREE to our Atlanta REIA Members! Thanks Duncan!!! The Lite Edition is for all Atlanta REIA Members and will scrape up to 25 leads per day. The Gold Edition (AKA Turbo Edition), which is a $500 value, is FREE for Atlanta REIA Gold Members Only and will scrape an UNLIMITED number of leads per day. If you are an Atlanta REIA Member, login to the Atlanta REIA Members Only Website first and then navigate to Members Only Downloads & Bonuses page where Duncan’s Online Lead Finder Software is listed 2nd in the list of available member downloads. I hope you all enjoy this lead harvesting software. Duncan, thank you again for this amazing software!